Brochures Are in the Mail! Watch for Yours! 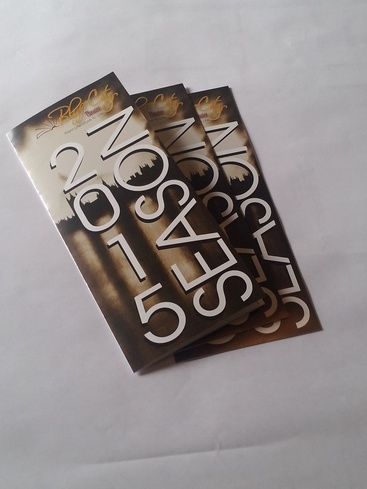 The 2015 season brochures are in the mail now. There’s still time to save big on your subscription- just $99 for all five productions if you act before December 31st. If you haven’t receive yours, you can still reserve a subscription online by clicking here. Andrew Edlin’s Churchill opens in just a little over 6 weeks. Don’t miss a moment of great live theater. Book now to guarantee the performance of your choice. Remember, subscribers get extra benefits like free exchange up to 48 hours before showtime and preferred choice of show dates and times. Be among the first to experience our newly renovated live-performance space at 212 Broadway in Historic Downtown Hannibal. Call the box office at 573-719-3226 Monday-Friday 10 a.m.-4 p.m. for questions or reservations. Previous article Our Goal-100 New Subscribers in December! Next article Join Bluff City Theater at Living Windows This Saturday 5-8 p.m.
Bluff City Theater kicked off its “Artists in the Classroom” series with performances at three area schools this week. Artists in the Classroom is one of a series of ongoing youth outreach programs. Bluff City Theater is committed to youth as part of its Performing Arts Incubation Initiative, introducing the next generation of young people to the magic and power of the performing arts.